Jensen 12Volt TV's Marinized for Boats have a gel coated circuit board which protects against oxidation and corrosion. These TV's are built on an internal steel chassis which makes wall mounting possible on boats. Screen size options range from 15inch to 32inch and power consumption ranges from 3-amps to 7.5-amps. Each of these models include a direct wire 12V power cord, but can be powered using the optional 110V power cord. Get more information on the Jensen 12Volt TV's marinized for boats. Our Portable 12Volt Televisions can be used anywhere there is 12 volt power. These units are all Digital TV compliant and most also include a built-in DVD player. From the small 7-9inch to the massive 32" these 12V TV's are loaded with features that you'll enjoy. All of our 12V LCD Televisions from 13" to the 32" are VESA wall mount compatible. All of our wall mounts are VESA compatible. 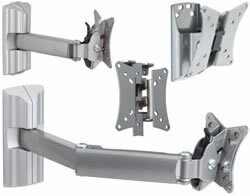 These wall mounts can be used with most of our 13" - 32" 12V LCD televisions. When using an extending wall mount on your boat, please make sure that it can be secured during movement or rough seas. These wall mounts are all very easy to install and use. Most have their own way of quickly releasing the TV for maintenance or storage. more about 12V TV Wall Mounts. With 12V TV's for your boat ranging from 7" to 32" we are sure to have a TV that's right for you. 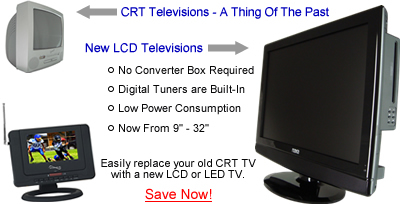 All of our TV's will work with satellite receivers, cable, VCR's etc. . .
Our LCD 12 volt televisions from 13" to 32" will double as a PC monitor (w/VGA input). Most TV's have an Audio/Video input and can also be used with many popular video game systems! Get the most from your new TV. Boost your antenna with the 12 volt TV antenna amplifier. This TV antenna amplifier draws very little power and do a great job at raising the antenna signal strength. Adding a New Digital TV Antenna to your boat will help bring in the digital signal. In most cases having a 12V TV antenna signal booster seems to make all the difference. The New 12V Amplified Hi-Definition TV Antenna by Antennacraft. This antenna is the best answer to date for an easy to install and highly effective 12V amplified antenna. Having many features the most enjoyable are high signal reception, simple remote control antenna rotation and the slim sleek design. We have many other antennas that will work great on just about any boat and are also pretty easy to install. 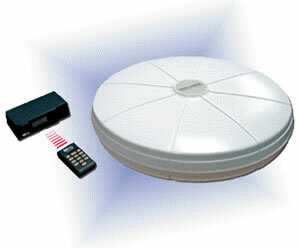 Other portable TV antennas may not be amplified but we do offer a 12 volt tv antenna amplifier. This booster works by adding it inline with the coaxial cable coming from the antenna to the TV. It also requires 12Volt power and consumes about .25amps. Click 12Volt Digital TV Antenna. Do you still have an TV with the old analog tuner? 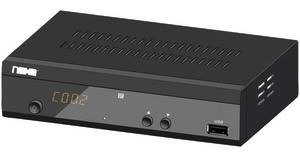 You might like to add a digital converter box that runs from your 12volt DC power! Eliminate the need for a new TV! Get the new 12-Volt Digital Converter Box. This little guy installs out of sight and the job is done in minutes. Adding a 12V Accessory Outlet has never been easier! More and more items are being adapted for 12 volt use everyday. From cell phone chargers to TV's and Refrigerators. To add a 12V outlet to your boat, we recommend using the MPPS-16ES. This outlet has a spring loaded flip lid to keep out dirt, dust and other foreign objects. This 12V outlet also has a 6' positive and negative power lead. This is wired directly into your vessels 12 volt charging/electrical system. The power leads can be hooked up directly to your 12V DC marine battery. 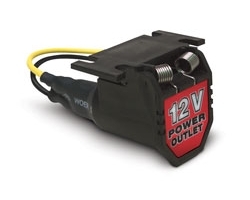 Find out more about the 12Volt Accessory Outlet for Marine Use.